Founded in 1931, the year of the County’s Centennial celebration, the Juniata County Historical Society’s Mission is the discovery, preservation and publication of Juniata County’s history. Our Archives Room is located in the lower level of the County Library in Mifflintown, where all of the Society’s resources for historical and genealogical research are located. 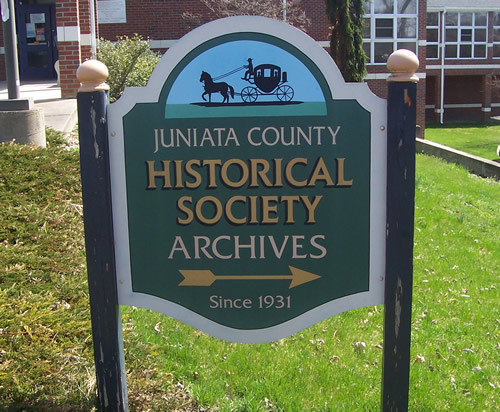 In the winter months the Juniata County Historical Society’s Archives Room will be closed anytime the Juniata County School District is closed for bad weather. At other times, snow and icy conditions can affect winter hours. Please call ahead to confirm that the Archives Room is open. We will try to accommodate research in the Archives Room at times other than our normal hours if arranged in advance. Please call or email the Archives Room at least 4 weeks in advance of your visit to Mifflintown. The Archives Room is closed from December to March, and any other national holiday that falls on a Tuesday or Wednesday. Please check our Events section on the Home page for closing info or check our Facebook page.